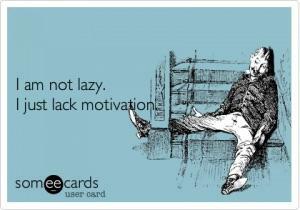 Is it true to say lack of motivation ? به طور مثال :نبودن انگیزه برای داشتن شغل مناسب که در شان تلاش تحصیلی انان باشد! A lack of motivation is a difficult problem because there are likely many factors contributing to it, but the simplest way to get your motivation back is to do something you want to do. I'm feeling completely aimless and unmotivated today. He/she has no purpose in life.